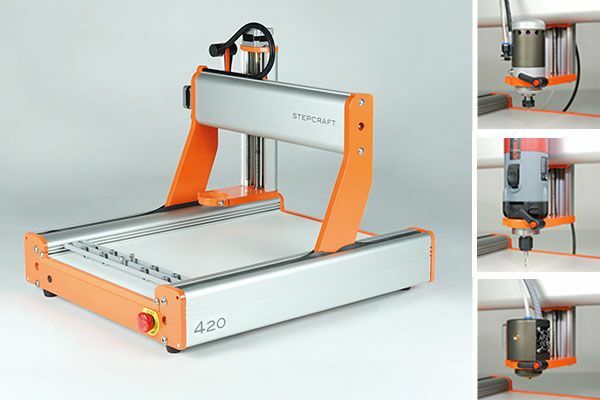 From model builder to electronics enthusiast to maker, with the STEPCRAFT CNC Systems hobbyists can give free rein to their creativity. Realize your ideas on only one machine - with a multitude of optionally available tools! This not only saves you space but also money because the purchase of expensive, additional machines is no longer necessary. Each of our CNC Systems can be equipped with various tools in no time: from the Spindle and the 3D Print Head to the Engraving Laser and the Drag Knife to the Plotting Pen, the Hot Wire Cutter, the 3D Touch Probe and many more. This allows you to process a large variety of different materials. Even complex projects with different parts can be accomplished on only one STEPCRAFT CNC System. Submit quick changes in your design file and shortly hold the newly manufactured and modified workpiece in your hands. Produce your workpieces in a professional, efficient and precise way - over and over again! Once achieved results can always be reproduced. Do not limit your creativity any longer! No matter if fine drillings, clear cuts or complex workpieces - CNC Systems open up a whole new range of possibilities that would manually be impossible. Drilling hundreds of holes into a brass sheet of 0.15 mm strength for the seats of a HADAG ferry in scale 1:25 and with a drill bit of 0.35 mm is undoubtely among them. You have no or little prior knowledge in CNC technology? In The CAD, CAM & CNC Workbook you learn everything you need to know in order to produce your first workpiece! A short introduction into the emergence of CNC technology is followed by plenty of knowledge regarding the basic functions of a CAD / CAM program. With Autodesk‘s Fusion 360, we are using a powerful tool that fascinates beginners and pros alike. The intuitive interface facilitates the first steps and allows for a quick orientation. Afterwards we explain the main functions of a machine control software with the help of UCCNC. Each chapter includes a theory section followed by the practical application of the recently gained knowledge in which a chassis of a model car is firstly being drawn before it is finally produced on a CNC System. Our customers use their STEPCRAFT CNC Systems for the most different purposes. While Markus Frey regularly astonishes the crowd with his model aircrafts in scale 1:2, Torsten Schoofs employs his STEPCRAFT for the production of circuit boards. This way, he is not exposed to the chemicals that would need to be used for etching. He can manufacture the 80 circuit boards that he requires for his domestic bus system in a precise and accurate manner comfortably at home and can install them directly. Look over the shoulder of our customers while they realize their fascinating projects and read about how and for which purpose they use their STEPCRAFT CNC Systems. Thanks to the numerous available tools you can process different materials with the STEPCRAFT CNC System. Among these are plywoods, laminates, EPP, ABS, PLAS, PE, PVC, Styropor ® , Lexan ® , Plexiglas ® , carbon fibers, brass, aluminum and many more.